​If you are a new parent, this 80-page eBook is for you! ​When my husband and I had Layla, we were overwhelmed with the amount of information coming at us for her first year. There was so much to research: everything from what to buy, what to feed her, whether to use formula, whether to make our own baby food, what type of schedule she should be on as she got older, etc. As a first-time parent, I was obviously so excited but immediately went to work researching everything I could since I wanted to make the best decisions for my baby. I read multiple books, blogs, articles, etc. just trying to figure everything out. On top of it all, I was tired! Pregnancy is beautiful but let's be honest, it's hard work! I felt frustrated that there wasn't just an all-encompassing book to read that would tell me everything I wanted. Sure, there was great research on all of these topics on their own, but I still had to invest a ton of time into all of them. Did I mention how overwhelming this was? A Guide to Your Baby's First Year is the solution. This will become your go-to resource as you make your way through those exciting first months. I did a ton of research, to help us navigate through all of the information out there, and after getting a lot of questions from first-time parents, thought it might be helpful to compile all of my research into an eBook for all of you! This 80-page, easy-to-read guide includes essential baby items, recipes and recommendations for your baby’s first year of life. All the research, done for you, all in one place and easy for you to refer back to. A detailed explanation of baby gear. What to buy, what not to buy and what we actually used and loved! Breastfeeding vs. formula feeding. Plus, a detailed guide on what the healthiest organic formulas are for your baby, and how to find them! How to prepare baby food at home. Includes tips and tricks on how to make it easy (and cheaper) than buying pre-made baby food at the store! A sample feeding & sleeping schedule for your baby from age 6-12 months. Who doesn't need this?! "The baby gear recommendations alone are worth their weight in gold..."
"All of the big box stores give you registry guides when you go into their stores, but I felt like it was more to sell their products than tell you the essentials of what your baby will actually need. Anjali's eBook gave me the advice I needed so I wasn't just aimlessly buying things we wouldn't end up using." "I absolutely love (and my baby does too!) the baby food recipes in this book..."
"I loved having a guide to refer back to at different points of my pregnancy and once my daughter was born! But I really enjoyed the baby food recipes and how easy they were to make. Oh and the sample eating and feeding schedule made my life so much easier!" Don't you have enough on your plate as a first-time parent? ​The research is done for you so you have one less thing to think about as a new parent. 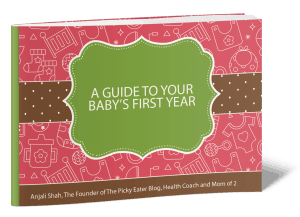 Get A Guide To Your Baby's First Year today! Save yourself from overwhelm and hours of research!